Custom Logos? YES, we can do it. A Custom Logo printed on the Director's Chair of your choosing is a great way to add a professional appearance to a show room or trade show. Since logos vary so much in design and complexity, it is best if your Request A Quote or call us at 866-732-8246 for information and to initiate an order. We can work together to choose the best method and pricing. The items below can be purchased online and use a rectangular format for printing your logo. Be sure to send us a high definition picture or logo for best results. 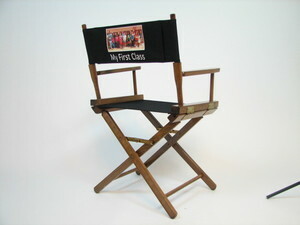 If all you are needing is text using a standard font, then we have a variety of methods to personalize your Directors Chair; our in-house facility offers Custom Embroidered Directors Chairs, as an alternative we also have Imprinted Text Directors Chairs. 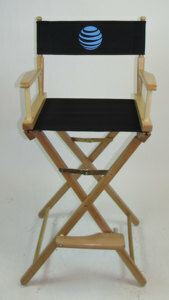 Everywhere Chair specializes in Customized Director's Chair Covers too.